These lines have been picked up from Athletic Bilbao’s centenary book, written by the then president of the club, Jose Maria Arrate. In this age of TV, the Internet and everyone getting their 15 minutes of fame, it is perhaps the sad story of Spain’s premier league that it is still known for only 2 teams. Many don’t seem to realize the true potential and the tradition of Spanish football outside the Big Two, and most fail to give other clubs their due.It is this indifference that begs a shout-out to one of the most successful and iconic clubs in Spanish and European football as well – Athletic Club de Bilbao. Bilbao was a leading port in the Basque country and was a driving force of the Spanish economy, with a very powerful business class.The sons of Basque industrialists, sent to study in Britain, developed an interest in the new game, and on their return began organizing matches with the local workers. In 1898, a group of 33 sportsmen headed by Juanito Astorquia, among which some met at the Zamacois Gymnasium to practice and talk about football, constituted a team and called it Athletic Club. Phil Ball notes in Morbo, that a meeting in Café Garcia, in 1901, formalized the formation of the club. Athletic’s main rival was Bilbao FC, which was founded by the local shipyard workers and miners from the north-east of England and shipyard workers from Southampton and Portsmouth, who brought with them the game of football to Bilbao. Both these clubs combined in 1902,forming club Bizkaya; they won the inaugural Copa Del Rey defeating Barcelona in the final. In 1903, Bilbao FC decided in its General Meeting to dissolve the Society and merge all its members in Athletic hence leading to the formation of Athletic Club de Bilbao. The club’s official site displays the name of the club as Athletic Club and is called in the same way by supporters today. This was the very first club to be formed, which led to the formation of other clubs in the Basque country – most notably Athletic Club de Madrid, which later evolved into Atlético Madrid in the same year. Also, Bizkaya have the distinction of being the very first Spanish club visiting a foreign country in 1902, where they visited Bordeaux and beat Burdigala 2-0. Athletic continued their dominance in Spanish football by winning the Copa Del Rey again in 1904. In 1907, they revived Club Vizcaya after entering into an agreement with Union Vizcaino, and then won in 1911. FC Barcelona and then Madrid FC, recognizing the need for a larger stadium, moved into Camp de la Indústria in 1909 and Campo de O’Donnell in 1912 respectively. These two stadiums were either taken on lease or rented, and were not properly built stadiums. Athletic have the distinction of having the first major purpose-built stadium when they built Estadio San Mamés, a name derived from a church nearby and because of a religious history associated with the church; Athletic Bilbao also gained the name Los Leones(the lions). On 20 January 1913, construction work began, and seven months later the new English style ground was a splendid reality. It had a capacity for more than seven thousand spectators, of which three thousand were comfortably seated in a magnificent wooden grandstand.Also, because of being the oldest built stadium and having a religious history associated with it, it is also called as La Catedral. 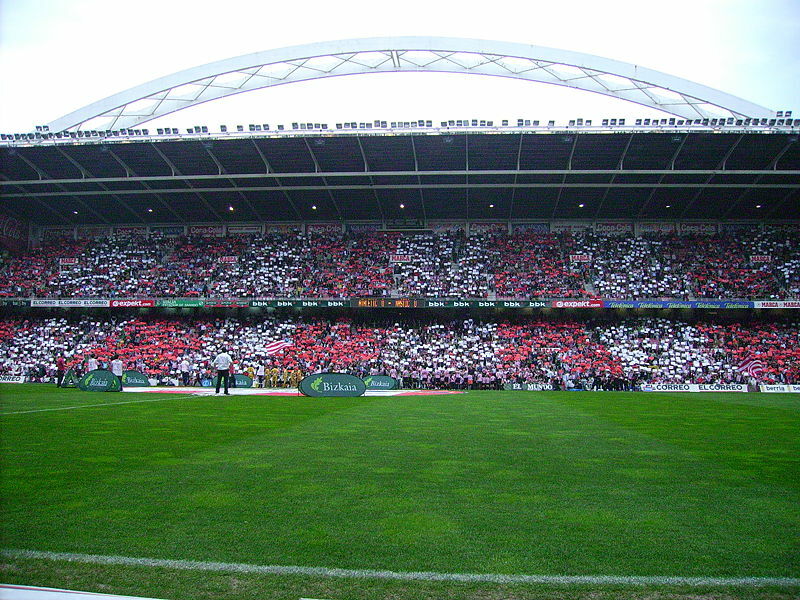 The members or socios of Athletic Bilbao football club contributed individually and invested in the construction of the stadium, making Estadio San Mamés an exclusive property of Athletic Bilbao football club. The most significant modification, which provided the element that characterizes the stadium, the mythic arc, dates back to 1953. It was the first time that an arc typology was used in a sports structure, besides being the biggest reinforce concrete roof in Europe according to the official club site. It is at this legendary stadium that Athletic Bilbao won a hat trick of Copa titles between 1914 and 1916; the team, with Rafael Moreno Aranzadi a.k.a Pichichi(little duck), a prolific goal scorer as their star, dominated Spanish football. Pichichi scored the very first goal in the San Mamés stadium on August 21 1913, and a hat-trick in the 1915 final. In 1920, Pichichi was a member of the football first team, which included 14 Basque players, that played at the Olympic Games in Belgium.He was the first big star for Bilbao. Sadly, the great Pichichi died in 1922 at the age of 29 due to a sudden attack of typhus. In 1953, Spanish federation decided to award the top scorers in the Liga with El Trofeo Pichichi, and the tradition still continues with Ronaldo and Messi fighting it out this year for the coveted prize. Athletic Club is one of the clubs that was a part of the inaugural Primera División or the Spanish National League, and have never been relegated since then. Though the inaugural season was won by Barcelona, Athletic club was the most dominant force in the 30’s, winning the Primera División in 1930, 1931, 1934 and 1936 and ending up runners-up in 1932 and 1933. They also won the Copa Del Rey four times in a row from 1930-33, making them the first team to do the double in Spanish football. Athletic Bilbao were coached in this glorious period by the legendary ex-Blackburn Rovers player, Fred Pentland, who had coached the French football team in the 1920 Olympics, and then initially coached them from 1922-25 and then came back for his second stint in 1930. El Bombín is said to responsible for introducing the short passing and one-touch football to Athletic and made them play a more elegant brand of football. Possession football- a term used today to describe Barcelona’s style of football, was actually introduced by Mr.Pentland at Athletic Club as early as in 1923. FC Barcelona in 1929 decided to adopt this style but were beaten 12-1 at San Mames in 1930-31, the worst defeat in the Catalans’ history and which is incidentally the biggest win in La Liga. In 1941, Athletic Club de Bilbao witnessed the rise of the next big superstar from their academy after Pichichi. Telmo Zarraonandia, also called as Zarra, stormed Spain and left his indelible marks on the history of Spanish football. Considered to be the greatest centre forward Spain has ever produced,he amassed an astonishing 252 goals in just 278 appearances for his club, and in the process won the Pichichi 6 times, a record which still stands. He has the highest number of goals in Copa del rey(81) and is the highest scorer in Atheltic Bilbao’s history with 333 goals. Zarra also holds the record for the most number of goals in a single season in La Liga, an amazing 38 goals in just 30 appearances in 1950-51, a record which stands to this day. In 2006, sports daily Marca introduced the Zarra trophy in honor of the great man; it is awarded annually to the Spanish national with the highest goal total in La Liga, and David Villa won the first Zarra trophy when he was with Valencia. The Zarra trophy is the second major trophy named after an Athletic Bilbao striker in La Liga. The neutrality of Spain in WW II meant that football would continue as always but Basques and Catalans faced a different sort of danger from the inside. It was General Franco who is said to have favored Real Madrid and is supposed to have crushed Catalans and Basques by forcing them to abandon their languages and cultures. An interesting fact to note here is that, Athletic Bilbao, the most successful team in the initial 8 years of Primera Liga by winning 4 out of 8 championships have won only 4 Ligas after the Spanish Civil war broke out. Even the great Zarra could manage to win only 1 la Liga in his illustrious career with Athletic. 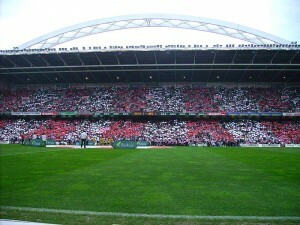 It was after the appointment of Javier Clemente in 1981 that Athletic Bilbao again reached dizzy heights as they won another 2 La Ligas in 1983 and 1984 marking this as another golden phase in the club’s history.Sadly, these 2 Liga trophies have been the last since and Athletic have not managed to win the Primera Liga since then. Its very difficult to describe Spain’s political divisions here but for starters,people living in the Basque region consider themselves ‘Basque’ and not ‘Spanish’. Basque and Catalans are known to stand up against the Franco regime during the Spanish civil war and the Basques in particular have fought to restore democracy in Spain. A fascinating account of this can be found in Phil ball’s Morbo, an exhaustive and gripping tale of history of Spanish football. The word Cantera’s origin is Spanish football can be dated as early as 1911 and Athletic Club de Bilbao was one of the foremost clubs which started the tradition of Canteras. The club’s Cantera had a simple statement or purpose but that statement means so much to the people associated with the club. “Con cantera y afición, no hace falta importación”. Athletic Club as an institution, along with its supporters are characterized by their desire to defend values which are becoming increasingly uncommon in football and in sports overall in the 21st Century. Our pride, reflected to the hilt in the club’s policy concerning the Young Player’s Reserve, has become a uniting force which outweighs the discrepancies to be found in our daily lives, making our philosophy different to any other and different to the way football is understood throughout the world. The club’s sporting philosophy is governed by a code which states that only players, who have come up through the club’s young players’ reserve or the young players reserve of the other clubs in The Basque Country, which includes the following territories: Bizkaia, Gipuzkoa, Araba, Nafarroa, Lapurdi, Zuberoa and Nafarroa Behera or players that were born in these territories, may be signed up. This rigid only Basque policy appears quite controversial considering that the club was formed by a group of foreigners, more specifically-British. According to an El Mundo survey in the 1990s, 76% of Athletic fans would rather see the club relegated than give up the cantera policy. The fans believe that they are the truest representatives of the Basque region and hate other parts of Spain and believe that their style of football and their culture truly embodies the Spirit of Spanish football. Even reserve team games are attended in huge numbers by people to cheer their players and a trip to the Basque region by most of the teams in Spain is considered to be a daunting task. In the past few seasons, Athletic Club have had their share of relegation battles but have survived. Currently, Athletic are in 5th position in the La Liga table and stand a chance of making it to the Europa League. In their hitman, Fernando Llorente, they have a centre forward who represents the Spanish National side and is considered one of the finest strikers in Spain. Also, their academy manages to churn out great talents, more recently, Iker Muniain, an 18 year old,wildly considered the next big thing in Spain. People might criticize Athletic’s Cantera policy but their impeccable record in the first division without getting relegated is a testimony of their belief in their values and their Cantera system. The Athletic Club headquarters are situated at the Palace of Ibaigane, a magnificent early twentieth century building located right in the centre of Bilbao, just meters away from the Guggenheim Museum and possesses, according to the Basque Government, sufficient values to be declared a Classified Monument. From the 2014/2015 season, Athletic will finally move out from their Catedral and play in the San Mamés Barria, a 55,500 capacity, UEFA 5-star stadium, built at a cost of 160 million euros whose expenses will be shared by the club and the Basque government. The plan of the stadium can be seen in great detail in the official document here. Football clubs with rich values and history, and more importantly that remain committed to their founding principles are rare in today’s era. Athletic Club de Bilbao still stands tall – quiet but proud, looking on sadly as the rest of the footballing world descends into a money-spinning frenzy. The illustrious achievements of Athletic Club are listed here. Great read…clubs like Athletic is an are a rare breed these days.